Let's assume for a moment that there is a particular variant of Science Fiction writing out there that deals with "green" ideas about sustainability and the environment. Let's assume that this variant operates in a Marxian "middle landscape" somewhere between the techno-fetishist tropes of "hard" science fiction and the character-driven socio-environmental concerns of "soft" science fiction. Let's call this variant "Pastoral Science Fiction." What, then, would fall under this variant? Certainly those novels, like Frank Herbert's Dune, or even Ursula K. LeGuin's The Left Hand of Darkness, that have a significant landscape component. I would even hazard that the origins of this type of science fiction lie somewhere in the works of Edgar Allan Poe, Harry Harrison, or H.P. Lovecraft (perhaps something like the latter's At the Mountains of Madness or The Whisperer in The Darkness). For the sake of argument, let me offer a corrective to this and other visions of a sylvanic future. For the greatest critic of Science Fiction Pastoralia may not be a writer, but a band. 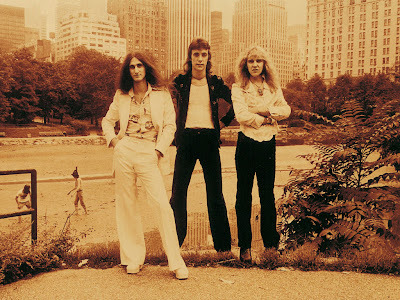 And that band is none other than the Canadian prog-rock power trio, Rush. 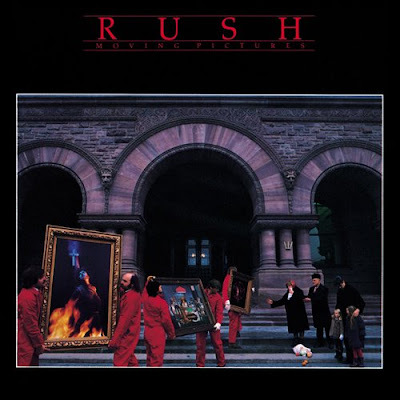 The second track of Rush's most famous and popular album, 1981's Moving Pictures, is "Red Barchetta". This song is, in many ways, standard Rush fare. A near-perfect, Voltron-like assembly of musical prowess and technical sophistication (or in prog-rock parlance, "chops"), Rush's music is best listened while staring at laser beams in a room full of smoke, or marveling at day-glo images of Jimi Hendrix, marijuana leaves, or spacecraft under repeated exposure to black light. Red Barchetta begins with guitarist Alex Lifeson gently picking out major-key harmonics in his guitar's upper registers. Geddy Lee's fuzzed-out Rickenbacker bass follows, only to be accompanied by drummer Neil Peart's acrobatic percussion. The song alternates in a soft-to-loud progression that anticipates Pixies' and Nirvana's dynamic noodlings by, like, almost 10 years. Red Barchetta even features one of the most aggressive uses of roto-toms in a song: their tuneful, machine-gun progression follows in what is a swirling, manic pas-deux between Alex Lifeson's bridge solo and Geddy Lee's bass wranglings. And then ... the voice. I remind you of slack-rockers Pavement, and their thoughtful invocation of Rush's must underappreciated and misunderstood element: Geddy Lee's voice. (In 1996's "Stereo", Stephen Malkmus thus sings, "What about Geddy Lee? / How did it get so high? / I wonder if he speaks like an ordinary guy?"). So, what exactly does Lee sing about? It was a fine morning in March 1982. The warm weather and clear sky gave promise of an early spring. Buzz had arisen early that morning, impatiently eaten breakfast and gone to the garage. Opening the door, he saw the sunshine bounce off the gleaming hood of his 15-year-old MGB roadster. After carefully checking the fluid levels, tire pressures and ignition wires, Buzz slid behind the wheel and cranked the engine, which immediately fired to life. He thought happily of the next few hours he would spend with the car, but his happiness was clouded - it was not as easy as it used to be. A dozen years ago things had begun changing. First there were a few modest safety and emission improvements required on new cars; gradually these became more comprehensive. The governmental requirements reached an adequate level, but they didn't stop; they continued and became more and more stringent. Now there were very few of the older models left, through natural deterioration and . . . other reasons. The MG was warmed up now and Buzz left the garage, hoping that this early in the morning there would be no trouble. He kept an eye on the instruments as he made his way down into the valley. The valley roads were no longer used very much: the small farms were all owned by doctors and the roads were somewhat narrow for the MSVs (Modern Safety Vehicles). The safety crusade had been well done at first. The few harebrained schemes were quickly ruled out and a sense of rationality developed. But in the late Seventies, with no major wars, cancer cured and social welfare straightened out, the politicians needed a new cause and once again they turned toward the automobile. The regulations concerning safety became tougher. Cars became larger, heavier, less efficient. They consumed gasoline so voraciously that the United States had had to become a major ally with the Arabian countries. The new cars were hard to stop or maneuver quickly, but they would save your life (usually) in a 50-mph crash. With 200 million cars on the road, however, few people ever drove that fast anymore. The story continues, ending with an account of the narrator going head-to-head against gleaming MSV's (Modern Safety Vehicles). In a tale of obdurant technology winning over new-fangled hard science, the narrator's MG roadster is able to elude the MSV's, so much so that these high-tech vehicles end up as piles of crumpled-up aluminum thanks to an engineered head-on collision. The image to the Road & Track story is consistent with the idea of Sci-Fi Pastorals. Here, an MG is seen cradled in a technicolor thicket of deciduous leafiness. In the background, two MSV's, strangely rendered as 30s-era gangster cars, collide amidst a wall of evergreens and a plume of noxious smoke. Though Geddy Lee would certainly not rank up there in the highest echelons of speculative fiction, "Red Barchetta" nevertheless paints an urgent image -- an image that anticipates the machine's reentry into the garden. How about digging into Bytor and the Snowdog next?